Should you grow grass under Trees? One thing I constantly get asked when assisting with the Master Gardener help desks, is "How do I grow grass under a tree?" The answer usually is, "You don't grow grass under trees." It can be very difficult to create a nice-looking stand because most grasses need sun to grow and the roots of trees (especially if they are shallow) will steal the water and nutrients. The solutions can be to create a mulch ring around the base of the tree or grow a ground cover. Growing a ground cover can be quite beneficial, as you don't have to mow and it can be virtually maintenance free. With that said, the first year of establishment will require some maintenance by adding compost to soil, regular watering and adding mulch to prevent weeds. In addition, the ground cover will eventually spread into the lawn if a barrier is not added. The following five ground covers will be separated into two categories. One category will take dry shade once established and the second needs moist conditions for ideal growth. Lamium has silver variegated leaves with showy purple, pink or white flowers that bloom from May to July. It grows 6 to 9 inches tall and has a 2- to 3-foot spread. When planting, it is best to space them 18- to 24 inches apart. This plant is resistant to deer munching. Pachysandra is an evergreen of whorled glossy leaves that blooms white in April. This plant grows 6 to 12 inches high and spreads 12 inches. When planting leave them 12 inches apart. This plant will need to be thinned once it becomes well established to prevent disease. It is resistant to rabbit and deer. Epimedium has compound heart-shaped leaves on wiry stems that turn red in the fall. It boasts attractive flowers of red or yellow in May. It grows 12- to 14 inches tall and spreads about 18 inches. They can be slow growing but are resistant to rabbit and deer. Wild ginger is a native ground cover with a kidney shaped leaf that blooms in April at the base of the plant. When looking, you will find a purple cup shaped flower that is usually covered by the foliage. It grows 6- to 12 inches tall and spreads 12- to 18 inches. It is resistant to deer. 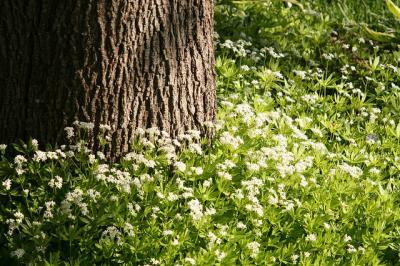 Sweet Woodruff has a delicate leaf but is a mat-forming ground cover that blooms white in late spring. It grows 8 to 12 inches tall and spreads 12 to 18 inches. It has fragrant flowers and foliage that smells like fresh-cut hay when crushed. 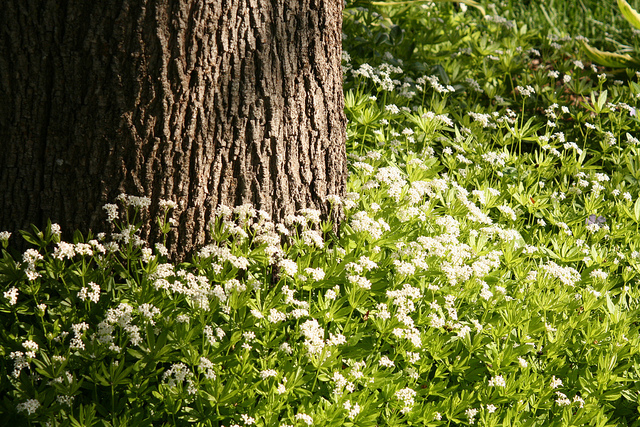 It can be planted under black walnut trees. This year, stop wasting time and money trying to get grass to grow under your shade tree and try growing these ornamental ground covers instead.